There are many times that this blog gets neglected because I am too busy to write. Today is really one of those times. 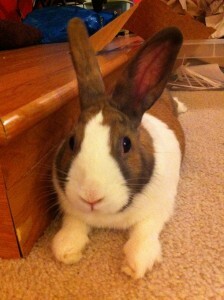 So, let me introduce you to Blog Bunny! This is Dewey. She and her older pal Ping will keep you entertained on this blog while I am off losing my mind trying to meet a deadline. *Upcoming posts: typesetting, broadsides, and Art Arttack!